This is a clear acrylic tiered jewelry display. The minimal and sleek design does not distract customers from the products on display and instead puts the focus on your products. The tiered construction also allows for easy organization and a better browsing experience for your customers. You will not have to worry about this jewelry display blending well with your pre-existing decor due to it simplistic design. There are circular lips on the ends to prevent any of your merchandise from accidentally falling. 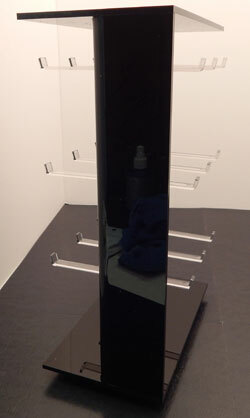 This acrylic jewelery display features polished edges to give a clean and professional finish. This is a rotating acrylic necklace display, able to display up to 17 necklaces. The top is 7" diameter and the necklace holder is available in 2 heights. Unibody design is very sturdy. Slanted angle makes this item perfect for use on a countertop. Minimal design fits well with any d‚cor. Clear acrylic construction is highly durable and gives a clean professional look.